Turkey has sent 24 tons of medical supplies to Somalia following a severe cholera outbreak, health ministry officials said Tuesday. 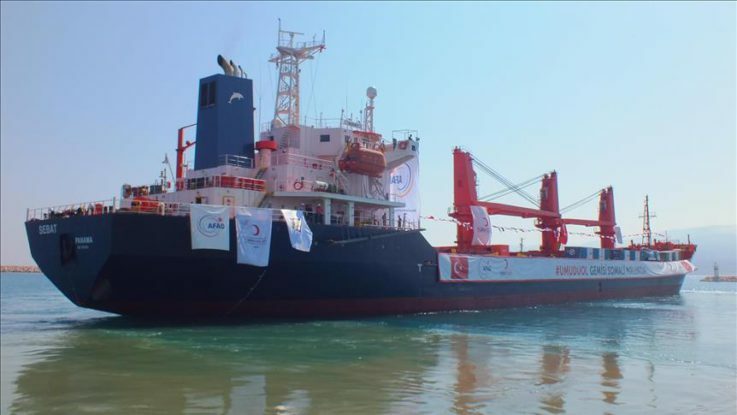 A ship carrying medical supplies set off from Mersin on Sunday, and is expected to arrive in the Somali capital Mogadishu in 15 days. Equipment provided by the Turkish Public Health Association was also dispatched to establish a community laboratory in Somalia, to identify food and waterborne infections. The Health Ministry acted on President Recep Tayyip Erdogan’s instruction to launch a special aid campaign for Somalia. Health Minister Recep Akdag met Somali health officials at the World Health Assembly earlier this year in Geneva. The 230-bed Somalia-Turkey Training and Research Hospital in Mogadishu has been at the center of relief efforts. The hospital sent 3 tons of medical aid to Baidoa, the region most affected by the cholera outbreak. A team of doctors led by hospital administrator Dr. Ali Kalyoncu will stay for two weeks. Patients requiring extra care will be transferred and treated at the hospital. So far, the hospital has examined more than 200,000 patients, performed 5,000 surgeries and carried out 10,000 dialysis sessions. Somalia is one of the several African states facing famine due to drought, which has led to a lack of clean water. Cholera has killed more than 600 people this year, according to the World Health Organization. The UN said at least 615,000 people have been displaced this year due to the drought and 40,000 children have stopped attending school.